In a dystopian future Australia, juvenile delinquents are forced to stay indefinitely at a drive-in movie theatre. 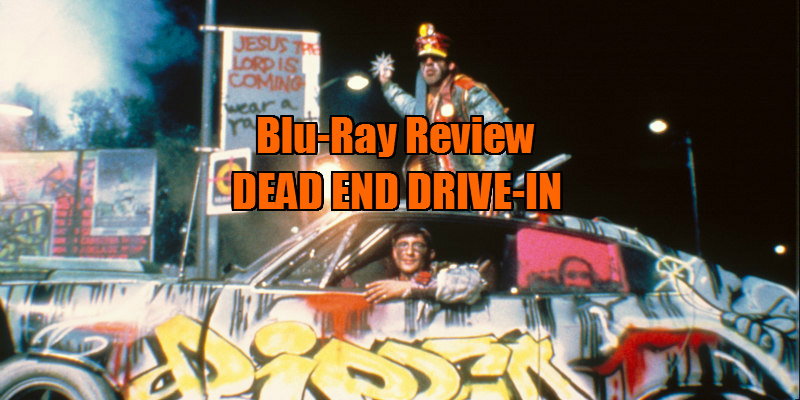 Thanks to a smart script from screenwriter Peter Smalley, adapting a short story by acclaimed Aussie author Peter Carey, Dead-End Drive-In manages to inject a degree of social commentary that's become a lot more relevant in the intervening three decades than at time of release. Ever since the success of Mark Hartley's excellent 2008 documentary Not Quite Hollywood: The Wild, Untold Story of Ozploitation! introduced a new generation of cult movie fans to the joys of Antipodean exploitation cinema, we've seen most of the 'classics' of the genre receive re-releases on disc. The latest comes from the filmography of that grand wizard of Ozploitation, director Brian Trenchard-Smith, in the form of his 1986 cult curio Dead-End Drive-In. Drive-in movie theatres are generally associated with the US - those of us outside America have a romanticised view of loading a convertible with a crate of beer, picking up your date, attaching a speaker to your window and chowing down on hot dogs and popcorn while some Roger Corman classic plays on a ragged weather beaten screen somewhere in the distance - but drive-ins were a huge part of Australian culture also. One fan of the format is Dead-End Drive-In's protagonist, Jimmy (Ned Manning), a resident of 1990s' (don't you just love how we're now living two decades after the period most '80s sci-fi movies were set in?) Sydney, a city ravaged by crime and unemployment. As in the Mad Max franchise, cars and their parts are valuable currency in this world, and violent gangs roam the city in search of wrecks to pillage from. The ever positive Jimmy keeps a brave face throughout this hellish reality, and borrows his brother's '56 Chevy to take his girlfriend, Carmen (Natalie McCurry, a dead ringer for a young Lucy Lawless), on a date to the local drive-in. While the young couple are steaming up the windows of the classic car, two of its wheels are nicked, by none other than the cops! Jimmy complains to the drive-in's laconic manager, Thompson (Peter Whitford), who informs him there's no way out - the drive-in has slyly been turned into a juvenile correctional facility, and filled with gang members. What evolves is essentially a sci-fi take on the prison escape movie format, but thanks to a smart script from screenwriter Peter Smalley, adapting a short story by acclaimed Aussie author Peter Carey, Dead-End Drive-In manages to inject a degree of social commentary that's become a lot more relevant in the intervening three decades than at time of release. Gazing upon the dusty, over-crowded setting of Dead-End Drive-In now, it's impossible not to think of the many refugee camps that have sprung up on the fringes of Europe. Late in the film, the punk inmates are joined by Asian immigrants, prompting them to join forces against the newcomers. Having just about managed to get on the right side of his fellow inmates, Jimmy finds himself their enemy once again when he stands up for the immigrants, even falling out with Carmen, who buys into the xenophobic rhetoric that begins to infect the makeshift prison. There's no doubt that had Dead-End Drive-In been made in 2016 rather than 1986, this subplot would have been given a more intense exploration. Frustratingly, it's dismissed just as it's becoming interesting here, as the film shifts gear into an all-action climax. It's unfair, of course, to criticise what is essentially a quickie exploitation movie for not focussing entirely on its political subtext, and that it's present at all here deserves praise. Taken simply as a six-pack and peanuts Friday night fun-fest, Dead-End Drive-In is perfectly satisfying, and the talents of director Trenchard-Smith and his production crew have created a movie that gets considerable value for its limited budget. It's directed with a real muscular energy and shot in a beautiful neon haze by cinematographer Paul Murphy, but the real plaudits must go to the production designers, who create a world here that resembles a 2000AD strip brought to life. The always entertaining Brian Trenchard-Smith provides a commentary track that plays like a feature length version of one of his Trailers From Hell voice-overs. Two short works by the director are also included - The Stuntmen, a doc on some of the great, and somewhat insane Aussie stunt performers of the '70s; and Hospitals Don't Burn Down, a 1978 public information film made to warn of the dangers of lit cigarettes in public buildings that is so over the top it threatens to overshadow the main feature as the highlight of Arrow's disc. There's also a trailer, a gallery of the work of graffiti artist Vladimir Cherepanoff, and a booklet featuring writing by critics Cullen Gallagher and Neil Mitchell. 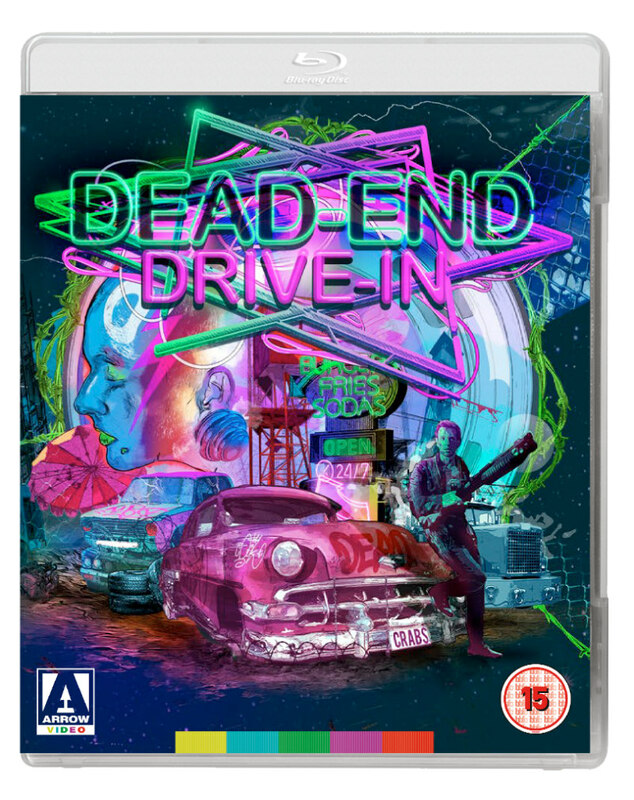 Dead-End Drive-In is released on Blu-Ray and DVD September 19th from Arrow Video.